Yesterday, we went out to lunch to celebrate some June birthdays. 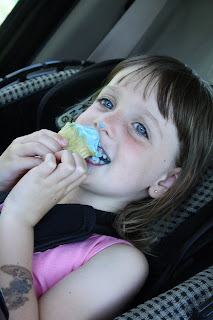 The kids wanted Blue Moon ice cream cones. Personally, I do not love the taste of Blue Moon ice cream, but I do love the color! I love how it complements the kids eyes. Sophia did a great job eating the HUGE "single" (talk about portion distortion) scoop I ordered her. These pictures were taken in the driveway after the 15 minute ride from A&W...15 straight minutes of me cheering her on. It sounded a little something like this. "Mom, look how good I am doing-no drips...oops only one drip." "Good job Sophia-keep licking...on the bottom too, and the side...no other side...OK lick your hand...where is your napkin...keep licking...here is a new napkin...oh lick the side...use your napkin...Good Job!" From the way I was eagle eyes on the 4 year old with an ice cream cone just imagine my attentive driving!!! Now normally the cool car keeps the ice cream from the melting double time, but yesterday, we drove the old Yukon which is currently air conditioning free (we are not sure whether to fix it or trade it in...one more scorching summer of debate I'm sure). So with a dew point at 80 yesterday the Blue Moon didn't stand a chance...neither did Sophia's hands, face, clothes or car seat!! Here are some "sweet" pictures of the Blue Moons...this time I am referring to Sophie's eyes!